At 05:52 LT Flight 495 took off from Amsterdam for a flight to Faro. The flight had been delayed for 40 minutes due to no. 2 engine reverser problems. After a flight of 2 and 17 minutes a the flight was cleared to descend to FL70. Shortly afterwards Faro Approach Control provided the crew with the following weather: wind 15deg./18 kts; 2500 m visibility; thunderstorms with 3/8 clouds at 500 feet, 7/8 clouds at 2300 feet and 1/8 cumulonimbus at 2500 feet, temp. 16deg. C.
Clearance to descend to 1220 m was given at 08:20, followed by a clearance to 915 m and 650 m 4, resp. 6 minutes later. At 08:29 the crew were informed that the runway was flooded. At an altitude of 303 m and 140 knots speed the approach became unstable and at 177 m the first officer switched the autopilot from CMD (command mode) to CWS (control-wheel steering). One minute later it was switched from CWS to manual and the airspeed began falling below approach reference speed. About 3-4 seconds short of touchdown elevator was pulled to pitch up and engine power was increased. When the no. 3 and 5 spoilers extended, the aircraft had a 25deg. bank, left wing up. The right main gear contacted the runway with a 900 feet/min descent rate at 126 knots, +8.79deg. pitch up, +5.62deg roll and 1,9533G. The right wing separated while the aircraft slid down the runway. The aircraft came to rest 1100 m from the runway 11 threshold and 100 m to the right of the centreline and caught fire. 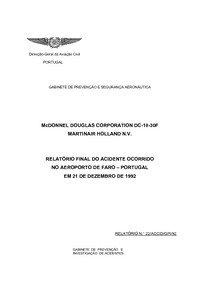 PROBABLE CAUSES: "The high rate of descent in the final phase of the approach and the landing made on the right landing gear, which exceeded the structural limitations of the aircraft. ; The crosswind, which exceeded the aircrafts limits and which occurred in the final phase of the approach and during landing. The combination of both factors determined stresses which exceeded the structural limitations of the aircraft. The Netherlands Aviation Safety Board commented that the probable cause should read: "a sudden and unexpected wind variation in direction and speed (windshear) in the final stage of the approach. Subsequently a high rate of descent and an extreme lateral displacement developed, causing a hard landing on the right-hand main gear, which in combination with a considerable crab angle exceeded the aircraft structural limitations. Contributing factors: From the forecast and the prevailing weather the crew of MP495 did not expect the existence of windshear phenomena. ; The premature large power reduction and sustained flight idle thrust, most probable due to crew action. ; CWS mode being disengaged at approx. 80ft RA, causing the aircraft to be in manual control at a critical stage in the landing phase." Distance from Amsterdam-Schiphol International Airport to Faro Airport as the crow flies is 1955 km (1222 miles).